Even though he is primarily a melee fighter, Thanatos has the ability to throw his scythe at enemies. The attack deals an incredible amount of damage, slows the victim, and heals Thanatos for 50% of the damage dealt. The only drawbacks are that it doesn’t hit multiple targets and takes 5% of Thanatos’ health with each use. But, the potential life gain with the attack outweighs the cost of life needed. The one real disadvantage to using Thanatos is his low amount of HP. If played well, he is a valuable asset to any team and an enemy to be feared in any encounter. But novices can expect to be punished repeatedly for any mistake as it is easy to eliminate him with several powerful attacks. Fortunately he has the ability, Scent of Death, which grants him immunity to and removes any slowing effects. His speed increases and actually doubles when moving in on a god that can be killed by Hovering Death. When he’s in close, Thanatos can use Soul Reap which deals fearsome damage and silences all enemies hit. Again, there’s a drawback to this ability with a reduced swinging rate and another 5% of his life consumed. However, the ability to silence enemies is absolutely devastating and typically leaves enemy gods running and leaving them ripe for the taking. Hovering Death is Thanatos’ most impressive ability and is his ultimate attack. Soaring into the air, Thanatos can move about the map at twice his normal speed and come crashing back to the earth with great force. Enemies below a certain percentage (depending on the level of the skill) are instantly killed while all others are stunned. This ability uses 10% of his max health, but his passive ability will transfer 20% of the fallen foe’s health to Thanatos. 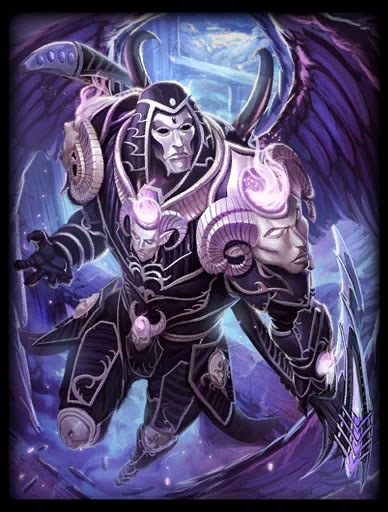 Thanatos is a terrific addition to the Smite pantheon and it’s not uncommon to see him in nearly every match. Despite having an absurdly low amount of health, his raw offensive power balances him out and makes him a force to be reckoned with.